These cookies are a little work, but worth it! They taste like sherried fruit & nut cake in a thin butter cookie. Perfect for Christmas Tea. 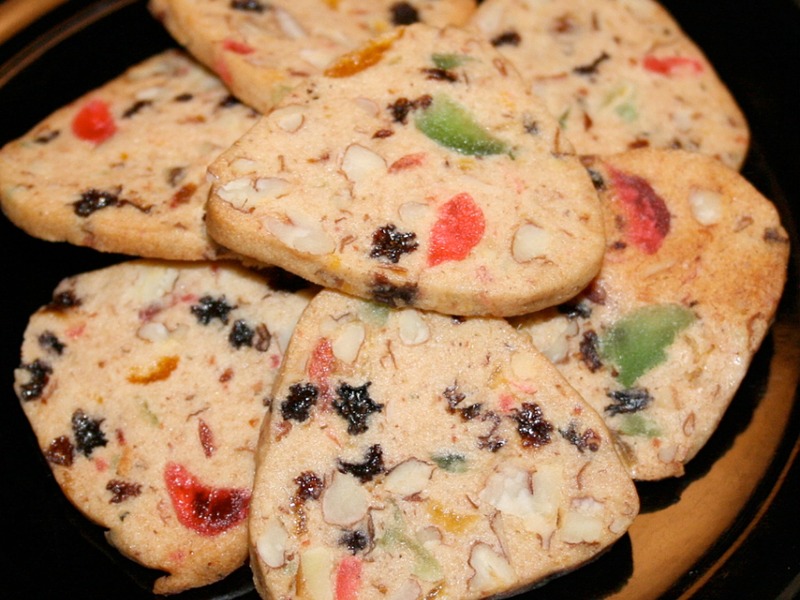 NOTE: preparation for the fruit in these cookies requires starting a day before you bake. Snip off the hard stems of the figs with scissors or a small knife and coarsely chop the figs. In a medium bowl, combine the figs, raisins, cherries, apricots, honey, sherry, lemon juice, pecans, and a pinch of kosher salt. Cover with plastic wrap and allow to sit overnight at room temperature. With your sharpest knife, cut the logs into very THIN slices (1/4 to 1/8-inch). Place the slices 1/2-inch apart on parchment-paper-lined baking sheets and bake for 15-18 minutes, until golden. Store in air-tight container. Cookies will be crisp at first and soften like butter cookies over the next few days. Adapted from Ina Garten’s BACK TO BASICS COOKBOOK. Teapots ‘n More Christmas 2010. Celebrate the season or chase away the Mid-Winter blues! Christmas and the winter season in general can be a lonely or difficult time for many, maybe even you. So, start a new tradition. Host a Christmas tea or chase away the winter blues in the company of friends, old and new! Cover table with a solid color tablecloth. Arrange paper doilies or handmade snowflakes on it. Cover the snowflakes with store bought net or tulle. This will keep the snowflakes in place. And it’s inexpensive! Place a flat mirror of any shape on table. Arrange pillar candles, sculpted candles or themed candles (like fruit, trees, etc) of different heights in your chosen color scheme on the mirror. Sprinkle table with some iridescent glitter. Or check out our Quick & Easy centerpiece ideas. Tip: Look in bargain stores for candles. A new ornament, a handmade Christmas treat, or a bubble bath gift bag made up of a scented votive candle, a packet of bubble bath, a tea bag and a piece of chocolate placed in a decorated paper sack.